The cops-and-mobsters thriller "The Departed" (2007), which director Martin Scorsese described as the first movie he's ever done with a plot, took the jackpot prize at the Academy Awards last night. For Scorsese, this was supposed to be a genre picture, not Oscar-bait like "The Aviator" and "Gangs of New York," but it turns out that, even at the Oscars, sometimes you can come out ahead when you don't look like you're trying so hard. Now, future generations can look back at Oscar history and say... "What!?!? The director of "Taxi Driver" (1976), "Raging Bull" (1980), "The King of Comedy" (1983), and "GoodFellas" (1990) won an Oscar for "The Departed"?!? Wasn't that the inferior American remake of "Infernal Affairs" (2004)?" Well, look at it this way: John Ford, famous for great American Westerns like "Stagecoach," "My Darling Clementine," "She Wore a Yellow Ribbon," "The Searchers" and "The Man Who Shot Liberty Valance," won four Oscars for direction, and not one of them was for a Western. Some other awards were handed out, too. Helen Mirren, as expected, saluted the Queen (the movie and Elizabeth II) with her award for Best Actress. Al Gore's movie got more Oscars than Best Picture contenders "Babel" or "The Queen" (2006) or "Letters from Iwo Jima" (2007) and tied with "Little Miss Sunshine." Forest Whitaker gave the most riveting and memorable speech, winning Best Actor for playing Idi Amin in "The Last King of Scotland." He broke all the rules -- getting so choked up at first that it seemed he might not be able to continue, and then reading his speech off a piece of paper. But the man is a magnetic performer, on screen and off, and once he got going he inspired the crowd with his moving and eloquent words about growing up watching movies at a drive-in from the back seat of a car in Texas. In a show with too much going on and that was slow to get going, the approach this year seemed to be to create artificial "suspense" by putting off announcing the high-profile awards that traditionally come early in the evening. Perhaps because the winners in the Best Supporting Actor and Best Supporting Actress categories were widely presumed to be "sure things," the sense of anticipation came from wondering when they would get around to handing out an award for someone in front of the camera. At the 45-minute mark, the most glamorous category of the evening had been art direction. "If there weren't blacks, Jews and gays there would be no Oscars," observed host Ellen Degeneres in her opening monologue. "Or anyone named Oscar, when you think about that." She left out Mexicans. Without "Pan's Labyrinth," "Children of Men" and "Babel," what would Oscar have done? "Pan's Labyrinth" earned the second-highest Oscar tally of the night (3), after "The Departed" (4). An hour in, it looked like it could have been a sweep for "Pan's Labyrinth" (two awards, for art direction and make-up, with cinematography to come), with "Little Miss Sunshine" (supporting actor Alan Arkin -- at last!) leading the Best Picture race. And then -- bam! -- they're giving out the adapted screenplay award? Wait, did I just fall asleep for two hours? 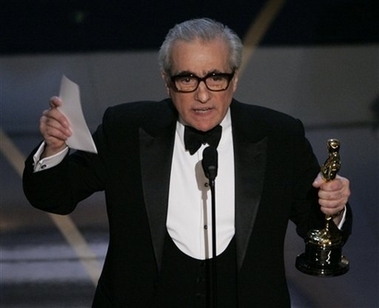 The winner was no surprise: William Monahan for "The Departed," the only Best Picture nominee in the category. One of the screenplay winners is virtually always the Best Picture winner... but the original screenplay award wouldn't be handed out for a little while yet. When it was, "Babel" was definitively out of the picture, and it would all come down to the cops and crooks from Beantown or the yellow VW bus -- especially when Thelma Schoonmaker took the editing award, which prognosticators have said is the best indicator of the Best Picture winner. Then there was Celine Dion. The Oscars usually fail most spectacularly when they stray away from the movies themselves, and taking a great piece of music (from Leone's "Once Upon a Time in America") and putting some lyrics into the mouth of Celine Dion was just a bad idea. It was the low point of the night.